Palm Springs - Yes or No? With only a couple of water hazards and wonderful old-school bunkering, the superb Players Course at Indian Wells Golf Resort is almost the anti-Palm Springs layout. If you have a second home somewhere in the Southwest you use to escape the cold and dreary North, good for you, your winter bolt-hole is already established. For golfers yet to invest in an extra house, however, the bottom-left of the country has a number of places you might consider to make your favorite sport a year-round thing. No doubt you’ve already sampled Scottsdale which, for a number of reasons – good ones, gets most people’s vote for the winter golf trip. Las Vegas doesn’t compete with Phoenix/Scottsdale for the quality and number of public-access golf courses, but does have a handful of really good rounds and scores pretty high in the entertainment department. Tucson’s ‘Pros’ column is considerably longer than its ‘Cons’ column though it will never sniff Scottsdale or Vegas’s snowbird action (probably something that appears under ‘Pros’), and Mesquite – 80 miles northeast of Las Vegas – has enough good golf courses for a diversion. Where, though, does Palm Springs fit into all this? I have a confession to make. In the last ten years or so, I probably wrote a dozen articles about golf in Palm Springs without ever actually visiting the place. When an editor says he wants a thousand words on the Coachella Valley two or three days hence, you don’t really have a lot of time to sort your travel arrangements and get down there. So you get on the phone and the internet (really quite useful for this sort of thing), and put together an article that may have a lot of the information readers need to make a quick decision on which courses to play and where to stay, but none of the insight that gives the place some color, provides a useful tip or two they may not read elsewhere, and heightens their anticipation before they leave. I didn’t know the small but surprisingly wonderful Palm Springs Airport had outdoor areas where you could sit under the palm trees and have a drink and a sandwich. But when I did at last visit Palm Springs a few weeks ago, I found everything else pretty much as expected. 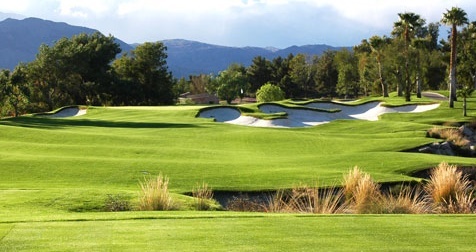 The golf courses, though a little engineered perhaps, were lush and pretty, with the area’s top layouts rightly ranked among the state’s best; too many fairways on the less desirable tracks were far too close to rows of homogenous condos; most of the downtown areas in the Valley’s nine cities were pleasant and attractive, the outlying areas less so; the surrounding mountains were a special kind of beautiful, but sadly less accessible than those in and around Scottsdale/Mesa/Phoenix/Fountain Hills, and Las Vegas; the reputation for being a mostly quiet retirement community populated by elderly golfers who own and, indeed, drive around in golf carts was well-deserved, though the push to attract a younger crowd was noticeable; the reputation for being expensive was also well-founded, but only the most myopic traveler couldn’t find a round, bed, meal, or cocktail at a reasonable price; the food, especially the Mexican, was mostly excellent; the weather was even better. 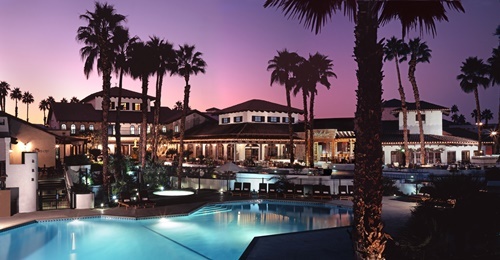 The Omni Rancho Las Palmas is a terrific lodging option. So yes, though you may not have retired yet and don’t even own a personalized golf cart, the Coachella Valley is most definitely a viable option. Book a trip for some time this winter and, who knows, you might like it so much it actually becomes your default winter golf destination. Here are 11 reasons you should get the new year off to a cracking start by booking a trip to Palm Springs and the Coachella Valley. The Greater Palm Springs Convention and Visitor Bureau (CVB) says the city gets 350 days of sunshine every year which, as anyone from our neck of the woods will tell you, is more than respectable. Elsewhere on the internet, you’ll see 354, ‘more than 350’, 330, ‘300+’ and one site that says there are ‘269 sunny days’ which either means a ‘day of sunshine’ is different from a ‘sunny day’ or that the chap who counted only 269 days of sun isn’t convinced a brief moment of sunlight squeezing through cloud should count. Whatever the proper definition, we can be fairly sure Palm Springs averages way more sunny days than where we live, and that whenever you show up for your round of golf, the sun will probably be out. And in January, the temperature will be 70 degrees. In February, it's going to be 74. Eighty in March. When it comes to building golf courses, John Fought is a traditionalist who doesn’t much like water hazards. He will concede that, more often than not, a course will need at least one to act as a source of irrigation, but he can’t abide their proliferation when unnecessary. So how did he react when the City of Indian Wells asked him to redesign Ted Robinson’s East Course at Indian Wells Golf Resort? Robinson was known for his elaborate water features, and unnecessary water hazards are two a penny in and around Palm Springs. Pinehurst, N.C., Augusta, Ga., Southampton, N.Y., Bandon, Ore., Mullen, Neb., - small American towns and cities synonymous with golf. To their number you must add La Quinta, Calif., where you not only find a number of top-drawer private courses but also the fairly remarkable PGA West development with its six courses – three public and three private, the La Quinta Resort with two Pete Dye designs (Mountain, Dunes), and the tremendous, city-owned, Arnold Palmer-designed SilverRock GC. Of the three pubic courses at PGA West – Nicklaus Tournament, Greg Norman Resort, and TPC Stadium, it is surely Pete Dye’s notoriously difficult Stadium Course that is the best known even though its one and only appearance in the city’s PGA Tour event – the Bob Hope Classic, Bob Hope Chrysler Classic, Bob Hope Desert Classic, Humana Challenge, etc – came in 1987 after which the pros pretty much refused to play it again. Nicklaus Tournament opened in 1987 and possesses table-top fairways perched above grassy channels either side, meaning that finding the fairway is beneficial certainly, but not essential. The most notable hole is probably the par 5 15th with its long, narrow island green that can be found in two, but is best-approached, by the resort golfer at least, with a short-iron from the right. Two thousand and fifteen is the last year of Humana’s involvement in the tournament which began in the valley in 1960 as the Palm Springs Desert Golf Classic. Last year Patrick Reed opened with three straight 63s before finishing with a 71 on the Palmer Private Course at PGA West to complete a two-stroke victory over Ryan Palmer. Reed will be back, of course, and also committed for the event, set for January 19-25, are Luke Donald, Ian Poulter, Brandt Snedeker, Zach Johnson, Jason Dufner, Keegan Bradley, Chris Kirk, Billy Horschel, and Phil Mickelson who announced in early December he would begin his 2015 season here and attempt to win the title for a third time. The LPGA’s first major of the year, founded by Dinah Shore in 1972 and designated a major in 1983, will continue to be played at Mission Hills CC in Rancho Mirage, but with a new name as Kraft Nabisco, which sponsored the tournament from 2002 to 2014, was replaced late last year by Japanese airline All Nippon. Lexi Thomson will be defending the title she won in 2014 by three shots over Michelle Wie. The tournament, now called the ANA Inspiration, is scheduled for April 2-5, making it a great late-winter event. In 1935, local electrical engineer Francis Crocker told newspaper publisher Carl Barkow how much he’d like to escape the Palm Springs heat by standing atop 10,834-foot Mount San Jacinto ‘where it’s nice and cool’. 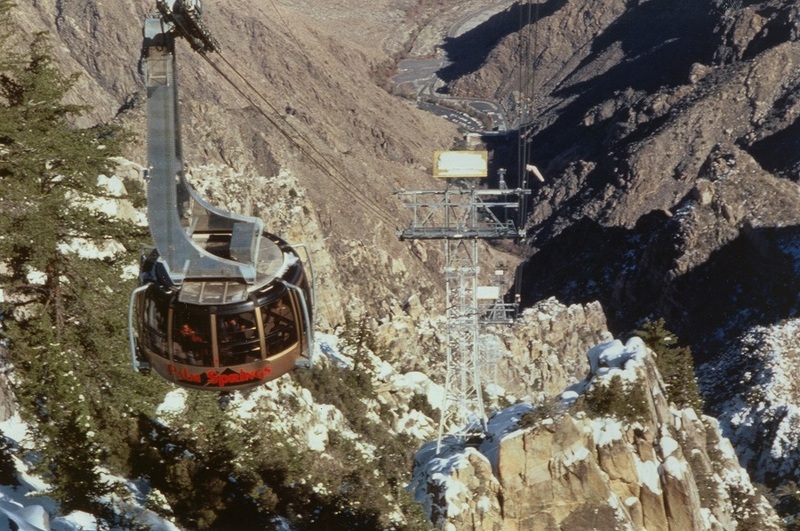 An idea for a cable car climbing the Chino Canyon was born. Due to numerous obstacles that delayed construction, Crocker’s dream wasn’t realized until 1963, however. In 2000, the original cars manufactured by the Von Roll Corporation of Thun, Switzerland were replaced by rotating cars made by Doppelmayr Tramways. The ride is 2.5 miles and 10 minutes long and climbs 5,873ft to the Mountain Station - 8,516ft above the Valley. The views are fantastic and stretch as far as the Salton Sea 45 miles to the east. A fascinating three-hour tour with Desert Adventures takes you out into the California desert where your guide explains plate tectonics and describes the famous fault system. You walk between steep canyon walls, and discover a natural palm tree oasis given life by a huge underground aquifer that holds at least 12 trillion gallons of water (the last time the US Geological Survey tried counting they reached that number before stopping) and which keeps the Valley’s golf courses green and lush while much of the rest of California has turned brown following three years of drought. The Delgado family of Mazatlán opened its original Palm Springs restaurant – Las Casuelas - in 1958 making it the city’s first Mexican restaurant (‘Casuelas’ was actually supposed to be spelled ‘cazuelas’ meaning cooking pots, but the restaurant’s marketing company got it wrong, and the ‘s’ stuck). The family has since opened four more venues of which Las Casuelas Terraza on Palm Canyon Drive is perhaps the most popular. With two open-air patios, high ceilings, romantic alcoves, live music, 75 varieties of Tequila, and a very extensive menu it’s not surprising Las Casuelas Terraza is one of Palm Springs’s most acclaimed restaurants. Desert Hot Springs, 11 miles north of Palm Springs across I-10, is a city of roughly 25,000 inhabitants and situated in the foothills of the San Bernardino Mountains. A haven for spa lovers with dozens of small spas fed by warm, underground, mineral waters, Desert Hot Springs also possesses a couple of golf courses – Mission Lakes, a decent and affordable track that suffers a little from the proximity of the surrounding houses, and the very fine Robert Trent Jones-designed Desert Dunes. A dip in a hot mineral bath is a fine way to follow 18 holes in the desert. In the mid-20th century, Palm Springs architects, inspired largely by the square, flat-roofed, unadorned houses of Germany’s Bauhaus movement, created an architectural style that became known as Desert Modernism. Popular with Hollywood stars who escaped LA for the desert, the style took hold and a great many elegant homes and landmark buildings were constructed. Fans should attend Modernism Week – a celebration of mid-century architecture held at the Palm Springs Art Museum and Hilton Palm Springs February 12-22. Granted, film festivals (or mid-century architecture) may not be the prime concern of the visiting golfer, but among the 140,000 film fans expected to attend this year's event (which runs through January 12th) surely someone will have packed their clubs hoping to squeeze in a round or two. This year’s program features more than 180 films from over 70 countries.